A field of roses at the end of Lowdham Lane is a well-known landmark in Woodborough and the white house rising above it stands out against the background of Ploughman Wood. Next to this is an extensive garden nursery and the whole complex is a reminder of the market gardening tradition in Woodborough’s history. The Timmermans family originated in Holland where they were successful rose growers from 1884. Arriving in this country in the 1950’s the late Joseph Timmermans settled in Woodborough and soon established a successful company growing top quality roses. In 1989 his wife Beryl extended the business by creating a garden centre on the adjacent field and their daughter Sophie joined the business after leaving university in the 1990’s. 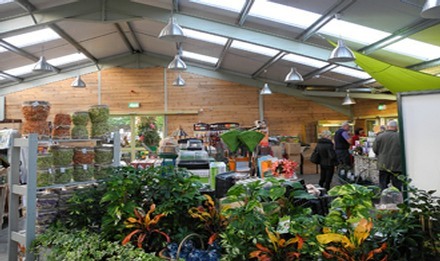 After her mother’s death she took over as managing director, joined by her husband Greg Delves, and soon planned an extensive programme of refurbishment and enlargement of the well established garden centre. The old greenhouses were demolished in 2011 and replaced with a new light and airy single span building with an extension behind incorporating a restaurant. The new building uses a number of unusual design features to enhance its visitor appearance such as the gabion style front wall which doubles as a 15 metre long raised planter. Visitors are also greeted by life sized driftwood horses in the entrance foyer before entering the main plant hall which showcases a wide variety of garden related products. The checkout is equally distinctive featuring curved gabions with a marble mosaic top. The outside display areas provide an extensive range of shrubs, plants and trees. Above left: Buildings of the rose growing business viewed from Woodlands House c.1960. Above right: Rose growing fields that stretch from Lowdham Lane to Ploughman Wood c.1982. Below left: The modern garden centre created in 1988 photographed in 2002. Below right: Mrs Beryl Timmermans with daughter Sophie at the sales counter 2002. Above left: The entrance and approach to the indoor garden accessories area in 2013. Above right: The indoor sales area in 2013.